DNG is pleased to bring 4 Loftus Close to the market, an excellent four bedroom family home. Having been newly constructed in 2013 the property is, as you would expect, presented in turnkey condition. On the ground floor a spacious entrance hallway leads to a very well appointed kitchen with utility room off. To the rear is a large living room with quality laminate dark oak flooring and double doors to the garden. At first floor level there are two double bedrooms with built in wardrobes and the main bathroom which is finished to a high standard. On the second floor the master bedroom is large and has an ensuite shower room. A final double bedroom to the rear completes the accommodation. Outside to the rear the garden has a westerly aspect which catches the evening sun. It has been thoughtfully landscaped with raised beds and an array of colourful plants and shrubs. A paved patio area leads to two stepped terraces which are finished with artificial grass making for little or no maintenance. To the side there is a driveway with space for up to three cars and a storage shed. Belmont is a well-regarded development with excellent transport links nestled at the feet of the Dublin Mountains. 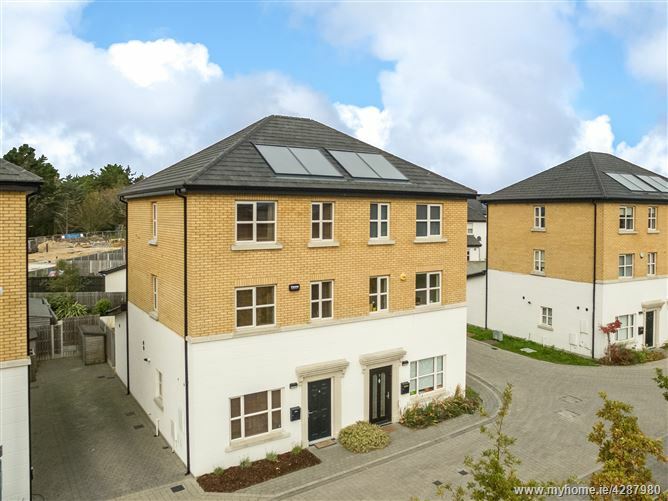 Stepaside and Sandyford Villages are within a stones throw while Dundrum town centre, Stillorgan shopping centre and Carrickmines Retail Park are all within a fifteen minute drive. Glencairn Luas station is 10 minutes walk from the property... a nice distance to walk before and after work! The number 47 bus also serves the area and has it's terminus in nearby Belarmine. Gaelscoil Thaobh na Coille & Rosemount School are witin a short walk as is a Crèche, playground and an excellent local convenience store and pharmacy. Fully fitted kitchen with Bosch integrated appliances, tiled splashback, tiled floors. Plumbed for washing machine, Vokera gas boiler, shelved storage. Spacious living room with Dimplex electric fire, laminate dark oak floor. Double doors to garden. Large double bedroom to rear with built in wardrobes. Large single or small double to front with built in wardrobes. Bath with shower fixture, wc, whb, tiled floor tiles walls. Large double bedroom to front with built in wardrobes. Shower cubicle, whb, wc, tiled floors and walls. Approx 131 sqm. / 1,410 sq.ft.